On December 6 and 7, a tour of historic homes was sponsored by the Historical Society. 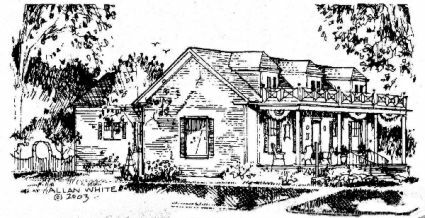 The objectives of the biennial Tour of Historic Homes is to collect historical information about North Manchester homes and to raise funds for Historical Society projects. Six homes were on the tour. Visitors to this Italianate style dwelling, built in the 1880's, are welcomed into the residence through the stunning original oak doors that feature beautiful stained glass and etched glass panels. This theme is repeated on other doorways and windows in the home. While much of the exterior has been altered, the interior retains the charm of the era of its construction. The original oak staircase just inside the front door leads to a surprisingly spacious second floor. The original woodwork extends to many rooms in the home. The Chapman's have utilized antiques and modern furnishings to maintain the timeless feel of the home. 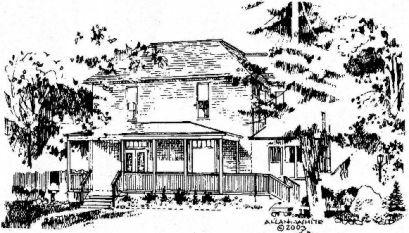 This house was the long time home of Jot and Minnie Freeman and family, prominent citizens in North Manchester's history during the past century. This charming Neo-classical style home was modeled after George Washington's Mount Vernon. The exterior of the home has not been altered since the house was built. The wide front porch welcomes visitors with its Chippendale balustrades and traditional lines. 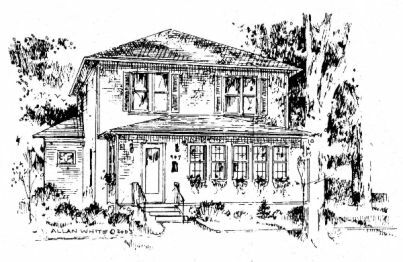 Swadener Williams built the home early in the 20th century for his bride, Amy. Swadener was the son of J.B. Williams, an early druggist in North Manchester. 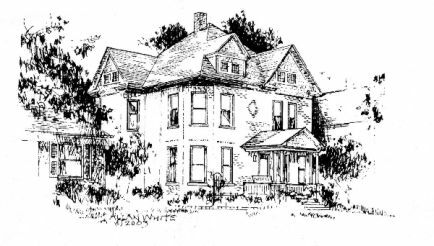 George Garber, a local attorney who did extensive upgrading to the interior of the house, later occupied the house. Another later occupant was Mrs. Devere Grossnickle, who was for many years the town clerk-treasurer. JP and Michelle Freeman have added their own distinctive touch and have accented the home with antiques from a variety of sources, including some original pieces from the Main View Tavern, which JP's family owned and operated for many years. This lovely Queen Anne style home has an interesting and varied history. It was built around 1918 by Samuel and Ida Gump who owned the plot for several years before building on it. It was sold to Calvin Ulrey in 1923, who in turn sold it to the Church of the Brethren in 1934 for one dollar. It was used as the church parsonage until 1957 and then as the church office until it was sold to the Hannaford's in 2000. According to the Hannaford's, the price was "more than a dollar". Workings without pictures or original blueprints, the Hannaford's have lovingly transformed the building into a home, doing much of the work themselves. The home is filled with many antiques and one-of-a-kind items, including handmade tiles. One of the most memorable features is a stunning oak fireplace surround, which is original to the house. This traditional American Foursquare style home has undergone extensive remodeling to its exterior over the years. The interior, however, retains its original design and charm. The American Foursquare or the Prairie Box was a post-Victorian style (1895-1925) that shared many features with the Prairie architecture pioneered by Frank Lloyd Wright. Its boxy shape provided roomy interiors for homes on small city lots. Later Foursquares often had the same type of interiors as Bungalows with open floor plans, lots of built-ins, and fireplaces. Popularized by pattern books and Sears Roebuck & Company mail order kits, the American Foursquare spread to residential neighborhoods throughout the county. One of the highlights of the Jones home is the original woodwork including a marvelous staircase typical of the American Foursquare. The Jones family collection of antiques features many interesting and unusual pieces, as one would expect in the home of a long time antiques collector and dealer. As its name implies, Tall Oaks is situated in seven acres of woods on the Manchester College campus. Built in 1970 through gifts made by MC Board Members and other friends of the college specifically for construction of a presidential residence, Tall Oaks serves as the home of President Marden and family, as well as being a focal point for many college events. The Mardens are the fourth presidential family to occupy the home. The first residents were A. Blair and Patricia Helman, who were involved in the design of the residence. In keeping with its natural setting, oak parquet floors and oak paneling are featured throughout the home. In the living room, the fireplace features a marble hearth, flanked by oak bookcases, providing a marvelous backdrop for the grand piano. The Marden's furnishings, collected from many travels, compliment the impressive residence, giving the house an intimate, personal feel. Originally built in 1847 by Henry Lantz, the three-story hotel was first known as the Lantz House. Henry Lantz then went to the California Gold Rush in 1849, while his wife ran the hotel for three years. The original portion of the building, which still retains many of its original windows, was moved to the rear of the property in 1881. The current front portion was added at that time and is a Second Empire design with a Mansard roof. It was built by Rufus Grimes and operated as the Grimes Hotel until 1892. The hotel was operated as the Sheller Hotel from 1892 until 1985. The Hospitality House currently is home to an outstanding bed & breakfast, as well as the Pattison family. It contains four guest rooms, an excellent restaurant, and the Pattison family living quarters. All of the guest rooms and the family quarters will be featured on the homes tour. 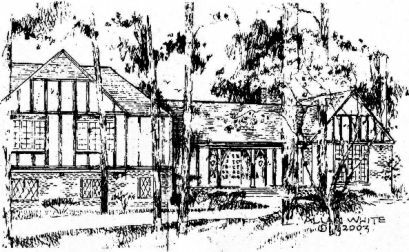 House sketches were used with permission of Allan White.